There are a variety of categories in Blogshares that go into determining rankings. One of these is Sigma. You get sigma by reporting errors. These can be things such as a blog’s title being changed or if the blog isn’t really a qualified blog. You also can get sigma for reporting “deads.” If a blog’s last post is six months old or more, it is dead. Aside from getting the points for sigma, you also get chips each time you report an error. Although there’s a lovely new automated dead finder to help ease this prcoess, I still enjoy “hunting for deads” the old way. I use lists of common first names or just words. I plug whatever the term of choice is into the B$ search feature under title and off I go. Another player recently told me he didn’t think there was a point to sigma hunting, but I rather like doing it. I find interesting blogs I might never have seen. I sometimes find very good live blogs that I can add to my stock portfolio. And well, I like order. I like the feeling of correcting errors, voting in correct industries, and culling out all of the junk. And of course, you get all those lovely chips for your labor. 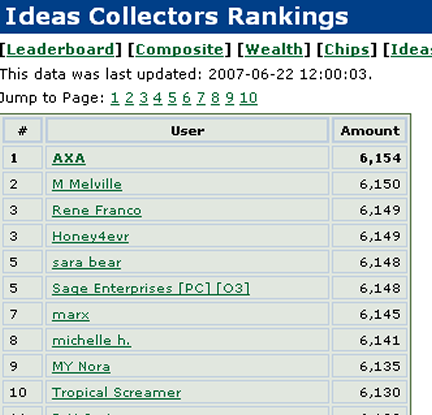 So I’m ranked second for ideas holdings. I’m sure this is just a thing of the moment. Most of the players in the top 10 are amazing when it comes to collecting ideas. One day I was doing a search on one of my blogs. There were several hits, but one stuck out. It was a listing for my blog on the Blogshares Market. It took me awhile to figure out what the heck was going on. Turns out Blogshares is an online game based on the stock market (well, somewhat anyhow) and blogs are the shares, or stocks. The more blogs that have linked to a blog (referred to as incoming links), the higher the value of that particular blog. There are ways to manipulate the value of a blog. Players buy and sell. They use artefacts to hype, buzz, slump, or cause a public relations disaster. You start out with a fictional $500. It is possible to play for free, which is how I began. These players, referred to as non-premium, don’t have access to the full set of tools and features and are limited in how many transactions they can use per day. I didn’t last long as a non-premium. Pretty soon I’d shelled out the $15 for a year of premium, unlimited play. I had no idea what I was doing. I read the help (which is very confusing) and stumbled through the game.